I would like to thank all the staff for the excellent care my cat received. I rescued her from the bitter cold and was not sure of the status of her health. I let my lovely new cat rest and gave her lots of food and love. I called the pet hospital the next day and was able to get an appointment that night! 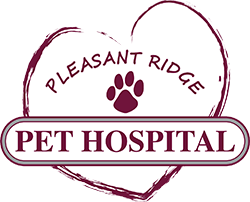 Thank you lovely ladies at Pleasant Ridge Pet Hospital. I wouldn’t even consider taking my little girl anywhere else!!! My Jack Russell Terrier is my baby. They treat her like a queen at Pleasant Ridge Pet Hospital, as if she was their dog. But I get to take her home. My dog Gizmo has bitten every vet tech and vet he’s ever been to. As a result, he was always muzzled at the vet’s. I took him to see Dr. Chase last year and was so impressed that she took time to talk to me, and to him until he relaxed. She refused to muzzle him, opting instead to earn his trust. Mission accomplished! By the end of the visit, he was doing his tricks for her in order to get some of that yummy chicken jerky! I can’t say enough times how wonderful both Dr. Chase and Dr. Jaax are. Any time anyone needs the name of a vet, you bet I refer this one! I just wish I could give them 10 stars! !